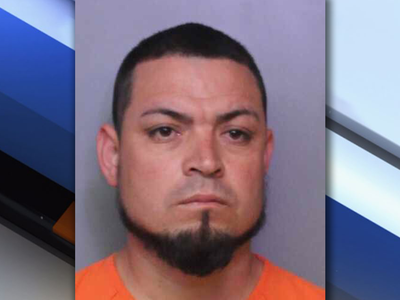 HAINES CITY, Fla. — A hit-and-run driver has been arrested in Haines City after a 17-year-old jogger suffered skull and facial fractures. The Polk County Sheriff's Office said, in a press release, 23-year-old Mario Lopez-Morales was arrested on Saturday, April 7 after hitting 17-year-old Adam Schumacher on Tuesday, April 3. According to an affidavit, Schumacher was jogging along Crest Lane in Haines City, shortly after 8:00 p.m., when he was struck by Lopez-Morales' dark colored pick-up truck. After Schumacher was struck, Lopez-Morales drove his truck through a front yard where he eventually came to a stop after hitting a parked van in the driveway — he then drove away. In hopes of finding Lopez-Morales, PCSO released details about the hit-and-run along with the Heartland Crime Stoppers tip line. 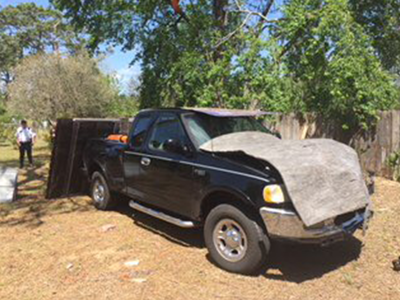 They said anonymous tips led them to Slocumb Road where they searched the property and located a black 1997 Ford F-150 pickup truck that was deliberately hidden behind two pieces of a wooden privacy fence, some carpet padding and a metal sign. Deputies said the homeowner told them that a friend of his asked if he could park his brother Mario's truck there because it was damaged after he had "hit a pole." After obtaining a search warrant, an examination of the visible damage to the truck and pieces of the truck left behind at the scene determined it was in fact the truck that hit Schumacher. During an interview, Lopez-Morales' wife told deputies, while in Las Vegas for an already-scheduled meeting for work, Mario admitted to her that he had been involved in a crash where he struck a person, and that he was going to turn himself in. Deputies said they called Lopez-Morales on his cell phone and that he confessed about being in the Crest Lane area on Tuesday because he was looking for his wife, with whom he had been arguing with since the previous day. They said he stated he was fumbling with his phone, trying to call his wife, when he hit Schumacher and then left the scene because he got scared. After making arrangements to fly home and turn himself in, Lopez-Morales met with deputies and repeated his confession he shared over the phone. "Every time we work a hit-and-run crash, we tell the community that we need their help — this is often the only way we solve crashes where suspects flee the scene. Thank you to the anonymous tipsters who led us to this suspect. We are grateful that Adam will make a full recovery, and that this suspect will be held accountable for hitting and leaving Adam for dead," Sheriff Grady Judd wrote in the press release. Schumacher is being treated for skull and facial fractures, and a sprained ankle at the Osceola Medical Center.